Originally published under the title "Lines in the Sand." If Arab cartoonists have it right, the Saudi-led break with Qatar could be lasting. The decision by Saudi Arabia, the United Arab Emirates, Bahrain, Egypt and Yemen to cut off diplomatic relations with Qatar is the latest step in the re-emergence of a clearly defined US-led Sunni Arab bloc of states. The task of this alliance is to roll back Iranian influence and advancement in the region, and to battle against the forces of Sunni political Islam. Little noticed by western media, this conservative Sunni alliance against Iran and Sunni Islamism has been under construction for some time. Saudi Arabia and the UAE were the first to recognize the new regime of General Abd al-Fattah al-Sisi following the military coup on July 3, 2013. Financial support from both countries has been crucial in ensuring the avoidance of economic disaster in Egypt. The Saudis and Emiratis were the moving force behind the interventions into Bahrain in 2011 and Yemen in 2015. In both cases, the intention was to prevent the advance of Iranian interests. The conservative Arab alliance against Iran and Sunni Islamism has been under construction for some time. Both Saudi Arabia and the United Arab Emirates maintained high levels of military spending over the last half decade, in spite of low oil prices. The two countries have sagely invested in air power and special operations forces – the areas most relevant to the type of wars being fought at present in the Middle East. The results have been visible over the last two years. 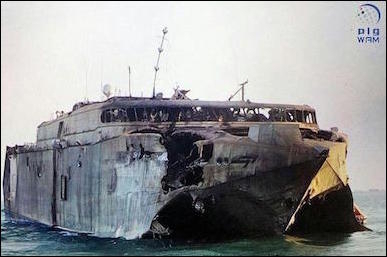 The intervention to prevent the advance of the Iran-supported Ansar Allah militia toward the strategically crucial Bab el-Mandeb Strait was the first real "outing" for Gulf Arab non-proxy military power (Operation Peninsula Shield into Bahrain in 2011 was a police action against popular unrest). An Emirati vessel hit by missiles in the Bab El-Mandeb strait on October 1, 2016. The results in Yemen have been mixed, but by no means constitute the debacle that the intervention has been presented as in some quarters. The Houthis remain in control of Sana'a, the Yemeni capital. But the nightmare scenario in which an Iran-supported force acquired control of the narrow Bab El-Mandeb strait, through which all shipping between the Gulf of Aden and the Red Sea must pass, was avoided. Emirati and Saudi special operations forces played a key role in the fighting. In Libya, Emirati air power, employed in support of General Khalifa Haftar's Libyan National Army, has played an important part in Haftar's fight against Islamist militants. The Emiratis built a forward air base, al-Khadim, in Marj province 100 km from Benghazi. AT-802 light attack aircraft and UH-60 Blackhawk helicopters operate from the base, according to satellite imagery published by IHS Jane's. However, the election of Donald Trump appears to have sharply increased the scope and ambitions of the pro-US Gulf Arab states. It is clear that they identify a similar regional outlook to their own in Trump and key figures around him. This raises the possibility of a more assertive and clearly defined strategy regarding both the Iranian and Sunni Islamist adversaries. At the Riyadh meeting on May 21st, 55 Muslim majority countries signed a declaration pledging to establish a "a reserve force of 34,000 troops to support operations against terrorist organizations in Iraq and Syria when needed." According to the final communique from the summit, the leaders present "confirmed their absolute rejection of the practices of the Iranian regime designed to destabilize the security and stability of the region and the world at large and for its continuing support for terrorism and extremism," and accused Teheran of maintaining a "dangerous ballistic missiles program" and of "continuing interference in the domestic affairs of other countries." A third of the document was devoted to criticism of Iranian regional activities. The election of Donald Trump appears to have sharply increased the scope and ambitions of the pro-US Gulf Arab states. The signing of the "Riyadh Declaration" took place following the visit of Donald Trump to Riyadh. Trump, in his speech at the summit, accused Iran of "spreading destruction and chaos across the region." Declarations by Gulf states have not always been followed by concerted action on the ground, of course. But with the current emergent stand-off between pro-western and pro-Iranian forces in eastern Syria, and the incremental loss of territory by the Islamic State in that area, it is not hard to think of the type of roles which a standing Gulf Arab "counter-terror" force would play, for example, in holding and administering Sunni Arab areas in cooperation with local forces. An additional, un-stated assumption behind the emergence of this bloc is that the energies of the Arab uprisings that began in late 2010 are largely spent. A bloc led by Saudi Arabia, the UAE and Sisi's Egypt will not seek to mobilize the revolutionary energies of populations. Rather, as with that of the Iranians, this alliance will be a top-down affair, featuring regular and semi-regular military forces carefully commanded and controlled from above. In this regard, it is interesting to note that the main "casualty" of the emergence of this alliance is Qatar, the country which above all others sought to fan the flames of the uprisings. 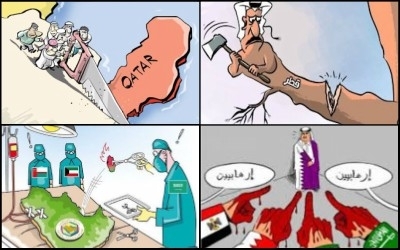 Qatar, through its support for Muslim Brotherhood associated movements and via its enormously influential al-Jazeera satellite channel, tried to turn the energies of the Sunni Arab masses in Syria, Egypt and the Palestinian territories into political power and influence for itself (while, of course, harshly suppressing any attempts by its own largely non-citizen population to claim rights). This project has failed. The lines of confrontation between the two central power blocs in the region are now more clearly drawn. For a moment, a large Sunni Islamist bloc based on Qatari money and Muslim Brotherhood power seemed to be emerging. MB-associated parties controlled Cairo, Ankara, Tunis and Gaza. Similar movements seemed plausibly within reach of Damascus. But this bloc proved stillborn and little of it now remains. The hour of the revenge of Doha's Gulf neighbors has thus arrived. The shunting aside of little Qatar, however, is ultimately only a detail in the larger picture. What is more significant is the re-emergence of an overt alliance of Sunni Arab states under US leadership, following the development of military capabilities in relevant areas, and with the stated intention of challenging the Iranian regional advance and Sunni political Islam. It remains to be seen what this bloc will be able to achieve re its stated aims. But the lines of confrontation between the two central power blocs in the region are now more clearly drawn than at any time in recent years.